In the Winter 2005 issue of Avenues, we discussed the important issue of how the mind can be negatively impacted by various conventional cancer treatments. Commonly referred to as “chemo brain” or “chemo fog,” patients often experience adverse effects in cognitive function. The original article, which provides general information on this topic, is available by clicking here. In this follow-up article, we discuss and summarize some of the latest research that has been published since 2005. We also identify recent research on vitamin, herbal, and dietary compounds that are known to help support brain cells, which may possibly provide protection from chemotherapy. This research on these “neuroprotective” compounds may point the way towards practical steps patients can take, in collaboration with their health-care providers, to help reduce or minimize the negative effects chemotherapy treatment can have on the mind. Earlier data suggested that among breast cancer patients receiving standard-dose chemotherapy, 18% showed cognitive deficits on post-treatment evaluations two years after treatment.1 Among patients treated with high-dose chemotherapy, that proportion rose to 30%. However, these numbers may be conservative as a recent longitudinal study involving breast cancer patients showed that high-dose chemotherapy caused changes in the brain’s white matter in up to 70% of individuals, usually with a delayed onset of several months after treatment. Researchers also found that neural progenitor cells (sometimes called “neural stem cells” since they have the ability to restore function in damaged nerve tissues) and oligodendrocytes (a type of cell found in the brain and spinal cord that helps improve the speed and reliability of impulse conductions, allowing faster information processing and better motor control) are exceptionally vulnerable to the action of chemotherapeutic drugs; this is the first study to show definitive evidence of chemotherapy’s damaging effects on the physical structure of the brain. What is particularly interesting about this study is that this damage was found both in vitro (cells cultured or tested in the laboratory) and in vivo (in live animals). This is important because it means that researchers could potentially test the effects a drug may have on brain cells in the lab before testing it on human subjects. Similarly, researchers could also lab test the effectiveness of treatments to help minimize the cognitive side effects of chemotherapy before involving actual patients. In a study published in the November 2006 issue of Cancer, the journal of the American Cancer Society, researchers used high-resolution brain MRIs of breast cancer patients and controls and observed the differences. They found that breast cancer patients had smaller grey and white matter in the prefrontal cortex, parahippocampal gyrus, cingulate gyrus, and precuneus one year after chemotherapy treatment. These areas of the brain are responsible for attention, concentration, and visual memory. Encouragingly, no difference between breast cancer patients and controls was observed at three years after treatment, suggesting that such damage is not necessarily permanent. Researchers also found that for patients who received tamoxifen along with their chemotherapy, the metabolism of the basal ganglia (a part of the brain responsible for motor movement) was significantly decreased when compared with patients receiving chemotherapy alone and compared to a control group. In contrast to the findings of the other studies discussed in this article, these researchers found that changes in blood flow were found five to ten years after completion of chemotherapy, suggesting chemotherapy can have very long-term detrimental effects on brain cells and cognitive function. While there is increasingly compelling evidence suggesting that chemotherapy does indeed have negative effects on the brain and central nervous system, there is relatively little research providing guidance for what patients can do to prevent or minimize these effects. While generally not specific to patients undergoing chemotherapy, a considerable amount of work has been done investigating readily available, over the counter herbal medicines and dietary supplements that may have neuroprotective benefits. It is important to note that most of this work has been done using cell cultures in the laboratory or on animals; relatively few research studies have been completed that recruited human subjects. Many of these herbal medicines and dietary supplements have long been used by practitioners of Chinese medicine or have been studied and used for health benefits unrelated to neuroprotection in humans. Additionally, for most of these compounds, safe doses have been established for human consumption. The research that still remains to be done is on what specific herbal medicines or dietary supplements would help protect brain cells from damage due to chemotherapy, and at what specific dosage levels. Therefore, we encourage people considering using the information presented here to review this material with their healthcare providers prior to proceeding with treatment. Important information to discuss in consultation include the individual suitability of specific compounds, appropriate dosage levels, and whether they may interact with other treatments, such as chemotherapy. An excellent resource for clinicians detailing herb-drug or vitamin-drug interactions is the Natural Medicines Comprehensive Database. Oxidative stress has not yet been identified as a cause of progenitor cell death due to chemotherapy. However, many chemotherapy agents cause oxidative stress throughout the body, which contributes to both the desired therapeutic effects – and the undesired side effects – of chemotherapy.12-15 As explained above, the growth and survival of neural stem cells and their precursor cells (progenitor cells and oligodendrocytes) is in part regulated by the level of oxidation, so decreasing oxidative stress may help to protect them. Coenzyme Q10 (CoQ10) is produced by the human body and is necessary for the basic functioning of cells. It is a vitamin-like substance that can also act as an antioxidant. Among other functions, it is incorporated into the mitochondria of cells throughout the body and facilitates and regulates the transformation of fats and sugars into energy. Patients with heart problems often use CoQ10. According to laboratory studies, the oxidative damage to oligodendrocytes can be prevented using coenzyme Q10.25 It may also protect oligodendrocytes during the terminal stages of maturation.26 Coenzyme Q10 is typically used in a dosage range between 30 and 200mg per day. Glutathione is a molecule synthesized in the body from three amino acids: L-glutamic acid, L-cysteine, and glycine. Glutathione is one of the body’s most important and powerful antioxidants and a depletion of glutathione can be damaging to oligodendrocyte progenitor cells.28 Glutathione is typically used in a dosage range between 250 and 500mg per day. N-acetyl cysteine is an efficiently absorbed and used form of the amino acid, L-cysteine. In laboratory studies, N-acetyl cysteine has demonstrated protective properties in the process of oligodendrocyte maturation.26 It is typically used in dosages ranging between 600 and 1800mg per day. Folic acid has been shown in laboratory studies to help stem cells proliferate.29 Folic acid is a member of the B vitamin family and is typically used in dosages ranging between 50 and 400μg. Since chemotherapy is currently an important element in many treatment protocols, future research must focus on developing strategies to help shield the brain from the toxic effects of chemotherapy as well as on the development of more selective and targeted cancer drugs with a lower side-effect profile. We believe that some of the work cited above can suggest potentially non-toxic vitamin or plant-derived compounds worthy of testing for their neuroprotective potential before, during, or after chemotherapy treatment. Neural stem cells (NSC) are cells that can mature into any type of cell and can continually renew themselves. 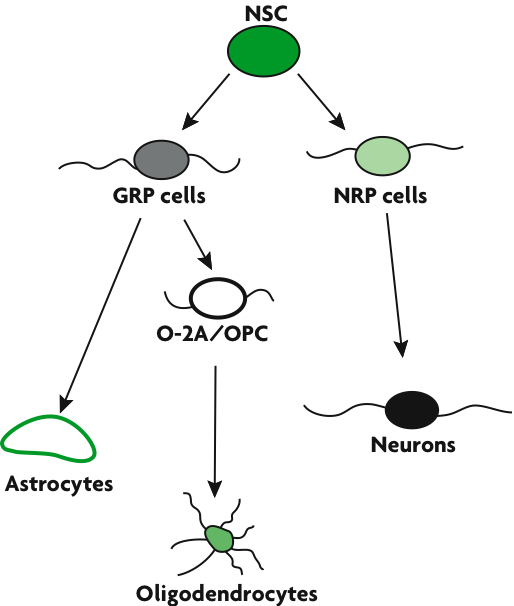 Astrocytes are cells in the central nervous system that, while they are not themselves nerve cells, provide several functions: (1) they provide a framework of structural support in the brain for nerve cells, (2) they provide metabolic support, assisting neurons to obtain nutrients, such as glucose, and (3) they are part of the blood-brain barrier which protects the brain. Neurons are the primary nerve cells in the nervous system that process and transmit information via electrical signals. Oligodendrocytes are cells in the central nervous system that, while they are not nerve cells themselves, provide support and nutrition to nerve cells, help form the myelin coating of nerve cells, and participate in signal transmission in the nervous system. Adapted from Dietrich J, Han R, Yang Y, Mayer-Proschel M, Noble M. CNS progenitor cells and oligodendrocytes are targets of chemotherapeutic agents in vitro and in vivo. J Biol. Nov 30 2006;5(7):22., Page 3, Figure 1. 1. Meyers CA, Abbruzzese JL. Cognitive functioning in cancer patients: effect of previous treatment. Neurology. Feb 1992;42(2):434-436. 2. Dietrich J, Han R, Yang Y, Mayer-Proschel M, Noble M. CNS progenitor cells and oligodendrocytes are targets of chemotherapeutic agents in vitro and in vivo. J Biol. Nov 30 2006;5(7):22. 3. Duffner PK. The long term effects of chemotherapy on the central nervous system. J Biol. Nov 30 2006;5(7):21. 4. Silverman DH, Dy CJ, Castellon SA, et al. Altered frontocortical, cerebellar, and basal ganglia activity in adjuvant-treated breast cancer survivors 5-10 years after chemotherapy. Breast Cancer Res Treat. Sep 29 2006. 5. Boik J. Natural Compounds in Cancer Therapy. Princeton: Oregon Medical Press; 2001. 6. Shen LH, Zhang JT. [Culture of neural stem cells from cerebral cortex of rat embryo and effects of drugs on the proliferation ability of stem cells]. Yao Xue Xue Bao. Oct 2003;38(10):735-738. 7. Kobayashi J, Seiwa C, Sakai T, et al. Effect of a traditional Chinese herbal medicine, Ren-Shen-Yang-Rong-Tang (Japanese name: Ninjin-Youei-To), on oligodendrocyte precursor cells from aged-rat brain. Int Immunopharmacol. Jul 2003;3(7):1027-1039. 8. Tang Y, Yin HY, Zeng F, Yu SG. [Pondering in-situ induction of endogenous neural stem cells in hippocampus of rats with Alzheimer disease by acupuncture]. Zhong Xi Yi Jie He Xue Bao. Sep 2005;3(5):351-354. 9. Faiz M, Acarin L, Peluffo H, Villapol S, Castellano B, Gonzalez B. Antioxidant Cu/Zn SOD: expression in postnatal brain progenitor cells. Neurosci Lett. Jun 19 2006;401(1-2):71-76. 10. Madhavan L, Ourednik V, Ourednik J. Increased “vigilance” of antioxidant mechanisms in neural stem cells potentiates their capability to resist oxidative stress. Stem Cells. Sep 2006;24(9):2110-2119. 11. Smith J, Ladi E, Mayer-Proschel M, Noble M. Redox state is a central modulator of the balance between self-renewal and differentiation in a dividing glial precursor cell. Proc Natl Acad Sci U S A. Aug 29 2000;97(18):10032-10037. 12. Abushamaa AM, Sporn TA, Folz RJ. Oxidative stress and inflammation contribute to lung toxicity after a common breast cancer chemotherapy regimen. Am J Physiol Lung Cell Mol Physiol. Aug 2002;283(2):L336-345. 13. Atessahin A, Ceribasi AO, Yuce A, Bulmus O, Cikim G. Role of Ellagic Acid against Cisplatin-Induced Nephrotoxicity and Oxidative Stress in Rats. Basic Clin Pharmacol Toxicol. Feb 2007;100(2):121-126. 14. Cortez-Pinto H, Alexandrino P, Camilo ME, et al. Lack of effect of colchicine in alcoholic cirrhosis: final results of a double blind randomized trial. Eur J Gastroenterol Hepatol. Apr 2002;14(4):377-381. 15. Woiniak A, Drewa G, Wozniak B, et al. The effect of antitumor drugs on oxidative stress in B16 and S91 melanoma cells in vitro. Med Sci Monit. Jan 2005;11(1):BR22-29. 16. Niles LP, Armstrong KJ, Rincon Castro LM, et al. Neural stem cells express melatonin receptors and neurotrophic factors: colocalization of the MT1 receptor with neuronal and glial markers. BMC Neurosci. Oct 28 2004;5(1):41. 17. Antolin I, Mayo JC, Sainz RM, et al. Protective effect of melatonin in a chronic experimental model of Parkinson’s disease. Brain Res. Jul 12 2002;943(2):163-173. 18. Ganguli M, Vander Bilt J, Saxton JA, Shen C, Dodge HH. Alcohol consumption and cognitive function in late life: a longitudinal community study. Neurology. Oct 25 2005;65(8):1210-1217. 19. Cayli SR, Kocak A, Yilmaz U, et al. Effect of combined treatment with melatonin and methylprednisolone on neurological recovery after experimental spinal cord injury. Eur Spine J. Dec 2004;13(8):724-732. 20. Kaptanoglu E, Tuncel M, Palaoglu S, Konan A, Demirpence E, Kilinc K. Comparison of the effects of melatonin and methylprednisolone in experimental spinal cord injury. J Neurosurg. Jul 2000;93(1 Suppl):77-84. 21. Sayan H, Ozacmak VH, Ozen OA, et al. Beneficial effects of melatonin on reperfusion injury in rat sciatic nerve. J Pineal Res. Oct 2004;37(3):143-148. 22. Pillai SP, Mitscher LA, Menon SR, Pillai CA, Shankel DM. Antimutagenic/antioxidant activity of green tea components and related compounds. J Environ Pathol Toxicol Oncol. 1999;18(3):147-158. 23. Chen CN, Liang CM, Lai JR, Tsai YJ, Tsay JS, Lin JK. Capillary electrophoretic determination of theanine, caffeine, and catechins in fresh tea leaves and oolong tea and their effects on rat neurosphere adhesion and migration. J Agric Food Chem. Dec 3 2003;51(25):7495-7503. 24. Cui Y, Shu XO, Gao YT, Cai H, Tao MH, Zheng W. Association of Ginseng Use with Survival and Quality of Life among Breast Cancer Patients. Am J Epidemiol. Apr 1 2006;163(7):645-653. 25. Arlt W, Callies F, van Vlijmen JC, et al. Dehydroepiandrosterone replacement in women with adrenal insufficiency. N Engl J Med. Sep 30 1999;341(14):1013-1020. 26. Cammer W. Protection of cultured oligodendrocytes against tumor necrosis factor-alpha by the antioxidants coenzyme Q(10) and N-acetyl cysteine. Brain Res Bull. Sep 30 2002;58(6):587-592. 27. van Meeteren ME, Hendriks JJ, Dijkstra CD, van Tol EA. Dietary compounds prevent oxidative damage and nitric oxide production by cells involved in demyelinating disease. Biochem Pharmacol. Mar 1 2004;67(5):967-975. 28. Back SA, Gan X, Li Y, Rosenberg PA, Volpe JJ. Maturation-dependent vulnerability of oligodendrocytes to oxidative stress-induced death caused by glutathione depletion. J Neurosci. Aug 15 1998;18(16):6241-6253. 29. Sato K, Kanno J, Tominaga T, Matsubara Y, Kure S. De novo and salvage pathways of DNA synthesis in primary cultured neurall stem cells. Brain Res. Feb 3 2006;1071(1):24-33. 30. Li J, Lin JC, Wang H, et al. Novel role of vitamin k in preventing oxidative injury to developing oligodendrocytes and neurons. J Neurosci. Jul 2 2003;23(13):5816-5826. This entry was posted on Wednesday, March 21st, 2007 at 12:00 pm. It is filed under Avenues, Becoming Your Own Advocate and tagged with Cognitive Decline.